Selangor, Malaysia, Oct 3, 2014 - (ACN Newswire) - Two papers in the latest issue of Pertanika Journal of Tropical Agricultural Science investigates the effects of low water input, and high salt levels, on rice growth. Rice is a staple food across Asia, with both people and economies reliant on its successful harvest. One paper finds that low water input does not affect rice growth as much as the levels of nutrients in soil can, and the second suggests that, although rice is seriously stressed by high salt levels in soil, this can be countered by the application of locally produced compost. Approximately 576 million tonnes of rice are produced globally each year, with about 90% produced and consumed in Asia. 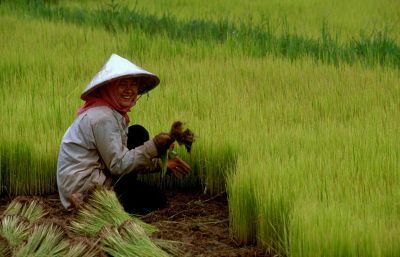 75% of the world's rice is grown in irrigated lowlands, and with water for agriculture becoming increasingly scarce, the question of the effect of low water levels on rice growth is becoming more critical. Jahan, M. S. and colleagues at the Faculty of Agriculture at Universiti Putra Malaysia, set out to determine the effect, on both rice production and the chemical properties of the soil in which rice grows. They found that iron content in soil slowly increases as rice is growing, but even more so after water is drained off. Manganese, on the other hand, increased sharply after flooding, but decreased after that. They found that water levels did not affect the growth of rice as much as expected. Their results provide recommendations for water management as saturation throughout the cultivation process does not seem to be as important as is believed. Low water input rice production could be implemented and fresh water saved for other sectors. In a second paper in the same issue, Muhammad Ibrahim and colleagues from Pakistan's University College of Agriculture and Government College University as well as the South Korea's National Academy of Agricultural Science, looked at salt levels in soil and the effect on rice growth. They took twenty day old rice plants and transplanted them into clay pots filled with either normal or saline soil. They found that the saline soil had a significant effect on the growth of the rice, but when they applied compost the results improved. Further work is needed to optimise the compost mixture and resulting growth but their work provides hope for many poor rice farmers as compost can be locally made and produced from a variety of waste materials. Jahan, M.S., Khanif, Y.M., Syed Omar, S.R. and Sinniah, U.R. (2013) Effects of Low Water Input on Rice Yield: Fe and Mn Bioavailability in Soil. Pertanika Journal of Tropical Agricultural Sciences 36 (1): 27-34. Mukkram Ali Tahir, Muhammad Ibrahim, Ghulam Sarwar, Yasir Iftikhar, Sang-Keun Ha, Kyung-Hwa Han and Yong-Seon Zhang (2013) Impact of Indigenous Industrial Compost on the Growth of Coarse and Fine Rice Varieties under Saline Environment. Pertanika Journal of Tropical Agricultural Sciences 36 (1): 61-70.